‘Victoria’ is an exhilarating cinematic experience, a dizzying one take spectacle that follows a drunken night out that quickly goes wrong, all in real time. We follow the titular character (Laia Costa), a Spanish girl who recently moved to Germany as she parties in a Berlin nightclub, leaving in the early hours of the morning and bumping into a group of young men who persuade her to continue her night drinking with them. The situation escalates when it becomes apparent this group are involved in some kind of trouble and the film takes a dramatic left turn into something more closely resembling a thriller. That this sudden shift in tone doesn’t feel jarring is testament to the skill and performances involved in making ‘Victoria’ what it is. The one take, real time approach isn’t just a gimmick. It gives the film a flow that fits in with the narrative and it makes ‘Victoria’ a really immersive experience, as if we’ve just dropped in on a key point in these people’s lives for a couple of hours. ‘Victoria’ effortlessly flows between different genres and the naturalistic dialogue lends a sense of realism to a film that becomes increasingly implausible as time goes on. This is due to a narrative that relies on an increasing number of plot conveniences to keep Victoria along for the ride, and it takes away from the characterisation when it’s clear that the characters are written to service the plot as opposed to the other way round. The plot demands that the characters make a series of bad decisions, but in virtually every scenario this makes these characters appear stupid and difficult to empathise with as a result. This is the downside of writing a script around an outline of key moments, without considering a natural way to lead your characters to these decisions and endpoints. It’s just as well ‘Victoria’ has generated as much momentum by this point that we can almost overlook these issues to just go along for the ride. This is largely helped by the gripping and intense performances from Laia Costa and Frederick Lau who make their characters believable even when the plot developments are at their most contrived. They are joyous and moving in tender moments that recall those brief moments in time where you strike up a temporary bond with a fellow reveller, and devastating when their situation dramatically worsens. Throughout they are remarkably convincing. 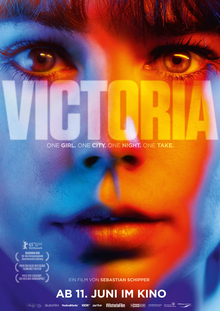 The handheld camerawork starts to really shake as the pace quickens and I actually felt nauseous at times watching, which wasn’t pleasant but emphasises how successfully ‘Victoria’ puts you right into the heart of its story. This is an impressive piece of filmmaking from Sebastian Schipper and whilst it’s not without its flaws, this is an ambitious cinematic experience that demands your attention.